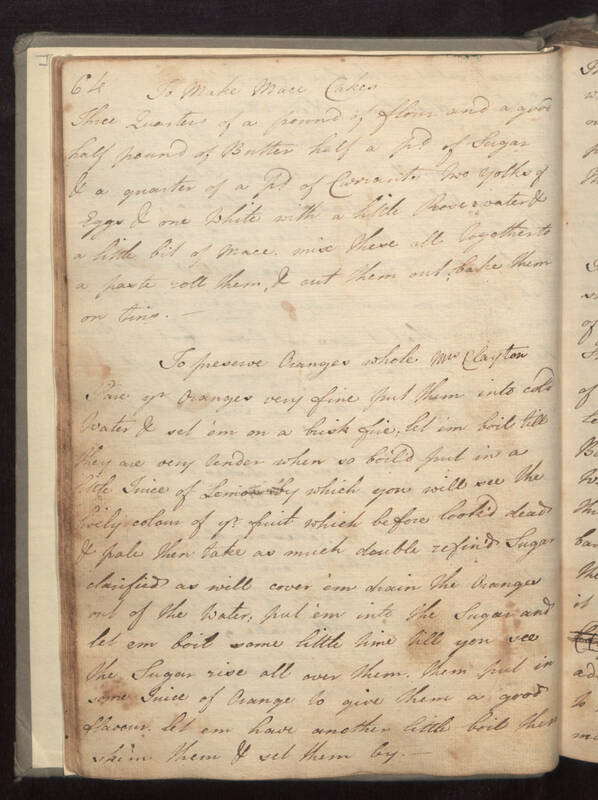 64 To Make Mace Cakes Three Quarters of a pound of flour and a good half pound of Butter half a pd of Sugar & a quarter of a Pd of Currants two yolks of Eggs & one White with a little Rose water & a little bit of Mace. mix these all together to a paste roll them, & cut them out; bake them on tins. To preserve Oranges whole Mrs Clayton Pare yr Oranges very fine put them into cold Water & set 'em on a brisk fire; let 'em boil till They are very tender when so boil'd put in a little Juice of Lemon by which you will see the lively colour of yr fruit which before look'd dead & pale then take as much double refin'd Sugar clarified as will cover 'em drain the Oranges out of the Water; put 'em into the Sugar and let em boil some little time till you see the Sugar rise all over them. Then put in some Juice of Orange to give them a good flavour, let em have another little boil then Skim them & set them by.